There is no accepted definition of the word “crisis”. Therefore it is easy to describe anything as such. Before the global financial meltdown a lot of Western countries had something called a “household debt crisis”, which meant they had taken advantage of cheap and easy loans because the banks were going out of their way to offer them, even though they knew that the customers would never be able to repay them. This “debt crisis” was really an unlimited supply of virtually free money, hardly a crisis to those who got it, and when the real problems came it was suddenly understood as such. So the protests in Armenia can be described as a crisis if someone wants to do so. But they are not a crisis but a diversion. The US needs more trouble in the region it is most involved in to draw attention away from other parts of the bigger picture. To get away with it, it has to pretend that Armenians are demanding what America wants to see, as this is the only reason which would justify subsequent US action. 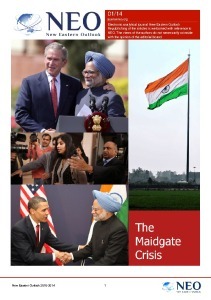 The source of these stories is Paul A. Goble, a Eurasian analyst who has served in various capacities in the U.S. State Department, Central Intelligence Agency, the International Broadcasting Bureau, Voice of America, Radio Free Europe/Radio Liberty and the Carnegie Endowment for International Peace. He is paid by Azeri lobbies and US defence contractors, and therefore by the US government. He also maintains the Window on Eurasia blog. We are therefore being told, as you might expect, that Yerevan is “enjoying” another Maidan Square-style uprising which will remove a “hated”, i.e. not Western-oriented, government. Other commentators however are saying that the protests are about electricity price increases. When they are asked, the protestors say the same thing. Again, this is what you would expect when Armenians are doing the protesting. There is a historic consistency to the Armenian mentality. It can be expressed in these terms: Armenians are set apart from the rest of humanity, are entirely self-sufficient culturally and have always been deprived of their rightful importance and territory by the machinations of their inferiors. This may be a stereotype, but it is the assumption which has lain behind the actions of all Armenian governments and national movements throughout history. It has lain behind them because it reflects the gut instincts of the people they represent, and assuming it guarantees those governments and movements enduring popular legitimacy. Armenians are not going to go running to the US to tell them how to run their own country. The US does not officially support Armenia’s claims in Nagorno-Karabakh, despite the best efforts of a well-funded Armenian lobby in Washington, and has not supported other territorial demands, in Georgia, Turkey and Russia, or the return of Armenian cultural treasures. The US may not be the enemy, but neither is it the sort of friend Armenians are looking for. So either Armenia has suddenly changed, in which case show us how and why, or Armenians are doing what the West has never been able to understand. During Soviet times most people in most parts of the Soviet bloc wanted to be rid of the Soviet Union. But almost all the active dissident groups consistently called for a middle way, a local system run by themselves, not a wholesale adoption of US institutions. Only when the imminent collapse of communism became clear, and the Western bloc was the only practical alternative, did anti-communist automatically equal pro-US. But the US helped entrench communism for so long by failing to understand this. It assumed that people who didn’t want the side they had must want everything the other side was offering in every detail, and thus failed to offer the alternatives which would have freed these countries from communism a lot sooner. Armenians would rather get cheaper electricity than go running into the arms of a West which doesn’t regard them as highly as they regard themselves. Very few people in Yerevan are demanding that Uncle Sam walk in and rescue them from their rulers. The US can help if it wants, but on Armenia’s terms, and history shows that Armenia won’t budge on this point even when others do. They have spurned so many previous offers for the same reason that they are not going to accept the implied US offer now, particularly when they see what has happened in Ukraine. In response to my questioning of Goble’s views on Armenia my neocon source sent me another Goble article, entitled Putin Seeking To Intimidate Journalists into Not Covering His Opponents. I therefore asked him whether he agreed with Goble taking a lot of money from Azerbaijan for his for-hire articles. Is such a person in a position to be standing up for the rights of journalists when his own independence is compromised? Is he speaking as a journalist or as the representative of his paymasters, trying to corral journalists into writing what he wants them to in exactly the same way? The US government Goble works for, in one way or another, has long maintained a policy of targeting journalists who are not embedded with the right people. That means taking them out if necessary, as they have in Iran and Afghanistan, where journalists have been murdered by US forces in so-called “friendly fire” incidents. Azerbaijan is hardly a bastion of press freedom either: according to the latest Reporters Without Borders World Press Freedom Index it ranks 162nd out of 180 countries, ten places behind Russia. Some years ago there was a campaign in the West to establish a fixed date of Easter instead of celebrating it on a different day every year. This fell apart when it was discovered that its main sponsor was the Secular Society, a group of atheists who don’t agree with religious holidays to begin with. The date of Easter wasn’t their business, and their agenda was clear, so the campaign had no credibility. Now events in Armenia are being spun by someone working directly for the governments of the United States and Azerbaijan. Azerbaijan is in a frozen state of war with Armenia over Nagorno-Karabakh and has every reason to want to bring down its government and even wipe it off the map as punishment. The US objects to Armenia’s dependence on Russian economic assistance, which was created by the Azerbaijani blockade resulting from this war, and the fact that it has lost interest in joining the EU. So is the commentator a credible journalist, or a politician pursuing unrelated political ends? 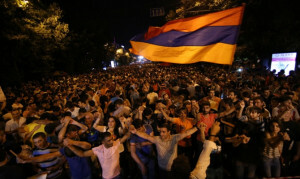 What is the US hoping to gain from hijacking Armenia’s protests? It is not so stupid as to think that it can install a compliant Armenian government and then bankroll it forever, as it would have to do. 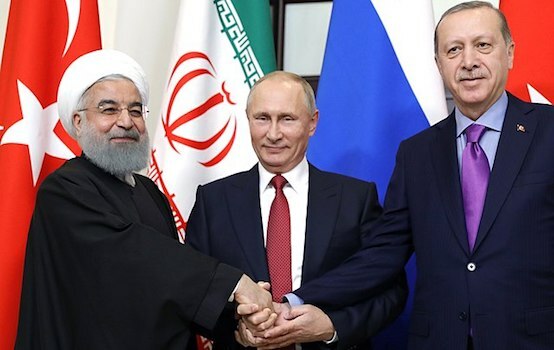 It pulled out of Afghanistan and inserted ISIL in Iraq merely because it was overextended, it is not going to throw more money and troops down the drain over Armenia. The answer lies in its connection to the Islamic State project. One of the reasons ISIL has been able to achieve as much as it has is the assistance given by Turkey. Whether it likes it or not, Turkey has become one of the transit points through which money, weapons and personnel are reaching ISIL. Those who suddenly disappear from their homelands, after receiving Western military training, and reappear as ISIL militants are all passing through Turkey to get to it. Turkey is a staunch US ally. It is also desperate to prevent the establishment of any Kurdish state, as the Kurds within its own borders would agitate to secede to that state. But ISIL is there to impose a Kurdish state by proxy, the US having failed to achieve this by other means despite its long-held ambition to do so. So Turkey can’t attack ISIL directly, as it would have done from day one had it been free to protect itself. It is now saying it is going to resort to arms to stop the flow of militants coming over its border. But its target is not ISIL but the Kurds. If you daren’t attack ISIL directly you can attack the Kurds and claim you are doing the same thing because they are all “terrorists”, without distinction. But when the operations are analysed and the real target becomes clear, this argument won’t wash, and both Turkey and the US know it. Under the cover of perpetual conflict, which is strangely absent now, the West could ignore or willfully misrepresent real issues. If Turkey attacks its own Kurdish citizens rather than ISIL, that is a real issue. If Armenians are fighting among themselves, and Azerbaijan takes its chance to gain revenge over Karabakh, there is no issue because that it just shows that people in that part of the world have to fight because that is what they do. If the cause of the fight is a “freedom-loving” people demanding Western solutions, no one needs to look for another reason or explanation. The Armenian government is on a par with Azerbaijan’s in terms of corruption and lack of transparency. People don’t like governments like that, anywhere. The hike in electricity prices has turned this discontent into major protest because it affects everybody. Armenians are protesting about electricity and blaming the government for the prices, just as people do in the US and everywhere else. No one has yet produced a quote from a protestor saying that installing a more Western-oriented government will reduce the electricity bills. Nor have they made any comment on the upcoming Turkish-Kurdish conflict, as they aren’t interested. But that hasn’t stopped the West from saying Armenians are demanding exactly what the West happens to want, to justify any sort of Western action. Konstantin Kosachyov, head of the Russian Federation Council’s international relations committee, told state-run news channel Vesti-24 last week that foreign NGOs might have fomented the unrest in Armenia, and even if they hadn’t, they will try and use it to pursue other people’s political agendas. As with Goble, he would say that, wouldn’t he, given who he works for? But we have seen this happen time and again, and Russia has nothing to gain from these protests.